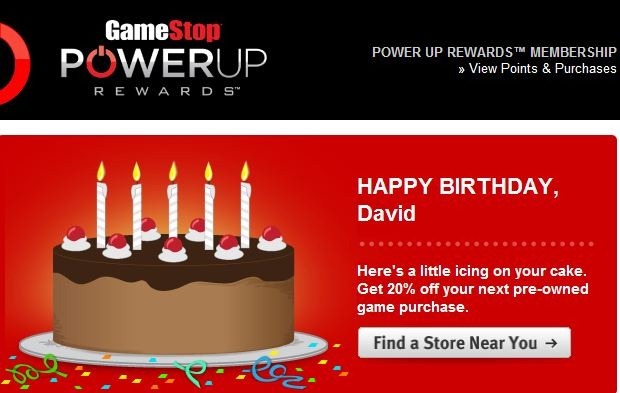 With the Big 44 a mere two weeks away, my inbox is starting to get inundated with all kids of worthless free birthday offers that I may or may not use. As was the case last year, I will share them with you to see how cheap retailers and restaurateurs have gotten. I will post them as I get them so in today’s case, you get two. Not only is this a step down from their former offers of a $10 store certificate, it’s also a cheap step back from last year. You see, that’s when they offered 4x bonus points with no strings attached. This year I have to use the Reward Zone credit card – I don’t have a single credit card to my name, let alone theirs – to earn 4x the points. But as you can see by my point total at the top, I haven’t been using my rewards lately. Frankly, I don’t really care since I’m no longer shopping there anyway. As overpriced as they may be, I do like perusing the used game selection at Gamestop because chances are if I don’t find anything, Anthony will. And it’s not like I’m looking to get something new like Halo Whatever or some other well-known franchise. I don’t do those games. I prefer mine with a gas pedal or a Mario character or a combination of both. And a 20% discount isn’t all that bad of a deal when the games I usually buy are less than $20. So there we go. Another two weeks of inbox offers to go! What’ll I get next? Posted in Birthday, Blogging 365	| Tagged Birthday, Blogging 365, Free Stuff! This is a head’s up to all drivers in the southern California area. So I signed up for yet another Coursera online course, this one about nutrition. I’ve only watched one video and I’m already falling asleep. I swear if my Health Meter was comprised of 10 little 8-bit hearts, I think I’d be on 3.5. Yesterday I had tremendous sinus pressure above my right eye and tonight it’s my left. The pain is so bad it feels like watering. What I’m saying is that this is about all I can handle for tonight’s entry. But at least I’m sticking to it.